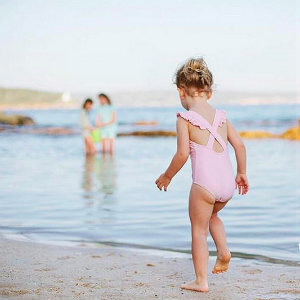 Thinking sweet and timeless swimwear for your little ones? In comes Minnow, a new contemporary children’s swimwear label made and designed in California. Timeless yet modern, playful and polished, minnow is a reflection of its founder, Morgan Smith, a mother and entrepreneur with a background in product marketing. After working in New York and Los Angeles, she returned to her hometown of Laguna Beach, with her husband and son. With the beach inspiring her daily life, Morgan envisioned a children’s swimwear collection with an elevated approach—sun-kissed color palettes, purposeful details, custom prints and high quality, hand-finished production, all locally made. With the minnow line, you can choose from boys boardies, briefs, and rashguards; for girls, bikinis, one-piece and rash guards; and a collection of beach accessories: an umbrella, beach games for the family, totes and even a suitcase. A recent collaboration with LoveShackFancy is perfect for moms and their girls. The capsule collection with LoveShackFancy brings their signature soft hand-dyed hues and elevated romantic florals to minnow's timeless silhouettes.